The revised Building Code for the Cook Islands and the newly-developed Strategic Roadmap for Emergency Management (SREM) were both launched on Tuesday, 18 December, 2018, by the Minister for Internal Affairs Sports, Police and Office of the Ombudsman, Hon Vaine Makiroa. These two Cook Islands projects were made possible under the €19.57 million ACP-EU Building Safety and Resilience in the Pacific project (BSRP) being implemented by the Pacific Community (SPC) and Emergency Management Cook Islands. Mr Louis Teiti, the Building Controller, Infrastructure Cook Islands said the potential for an increase in the intensity of cyclones in the Cook Islands prompted the need to review the building code and ensure that building infrastructure is up to standard. Mr Carlson said an increase in the severity and regularity of natural disasters in the Cook Islands in recent years had prompted various disaster alleviation methods and strategies to reduce the risk of loss of life and property in a severe ‘event’. Mr. Carlson said the roadmap was timely and resulted in the maximising of limited resources to get maximum outcome. 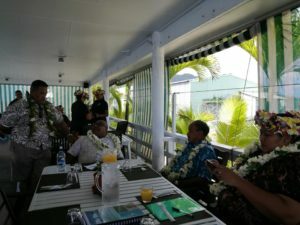 He said it would act as a guide and support the Cook Islands Joint National Action Plan (JNAP) for Disaster Risk Management and Climate Change Adaptation. Mr Carlson noted the consolidation of climate change and disaster risk management in the Cook Islands was a step in the right direction.